Hey there #Woke People! 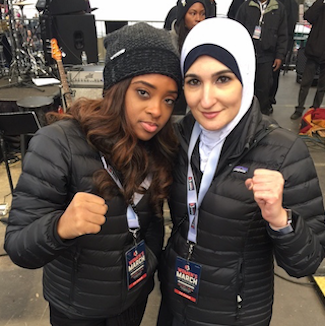 Linda Sarsour and Tamika Mallory here and we are about to drop some knowledge on you! So have a seat and grab a coffee: it’s about to get Intersectional up in here! First off, we are about tired of certain folks out there saying we have a beef with Jews. That is just a Big Lie being pushed by a bunch of Likudniks drinking the Haterade! The real deal? We oppose Israel’s unjust and illegi…… OMG OMG! Is that Louis Farrakhan??? Giant FanGirl moment, know what I’m saying? Do you think we can get a selfie with the Minister? I mean, like, another one. So, umm, when are you going to stop wearing your Purim costume? That’s it, folks. We have a Winner. BREAKING: Daily Freier forced to retract satirical article about Bibi naming Golan Heights town after Trump due to Bibi naming Golan Heights town after Trump. Mr. Trump! Please tell us the story of Pharaoh’s daughter! Is Tossed Salad Kosher for Passover? The Daily Freier’s Alert Readers have the answers! Your gentile friend who "just loves loves loves matzoh"? Well she's an idiot. Mr. Trump! Please tell us the story of Pharaoh's daughter!